A prototype of the Kamov Sever-2 aerosled in its element. Anon., « ’Mail Train’ to North. » The Gazette, 26 March 1959, 2. Zdrasvstvuyti / hello, my reading friend, and welcome to what appears to be yet another non aeronautical or spacey issue of our blog / bulletin / thingee. Before you blow the proverbial gasket, please allow me to point out that there will be some aeronautical content in the paragraphs below. Indeed, may yours truly introduce the first element of this content, in order to prevent your discontent, by quoting the caption of the photo I found in the 26 March 1959 issue of The Gazette, a newspaper from Montréal, Québec, with a very long history? This is the new Soviet aero-sleigh, the “Sever-2,” designed for passenger, mail and freight transportation in the Far North. Power is furnished by a 260-horsepower aircraft engine driving a three-bladed propeller. It can go at a speed as high as [95 kilometres / hour] 60 miles per hour over flat snow. Cabin is heated with a special stove. See, see. Some aeronautical content. Yay! Sorry. You may be interested to hear (read? ), or not, that the preparation of this article was a rather new experience for me. Yours truly had not used so much source material written in a language I could / can not read before. I can only hope that my interpretation of said material will not be off the mark. Where to begin? The beginning would be a good place, don’t you think? The country known in 2019 as Russia is big. “You just won’t believe how vastly, hugely, mind-bogglingly big it is,” my reading friend, if I may quote, out of context, Douglas Noel Adams, the author of the hit radio comedy show The Hitchhiker’s Guide to the Galaxy, put on the air in 1978 by the British Broadcasting Corporation. Large areas of that country, the largest in the world if you must know, are quite flat, devoid of trees and covered in snow for many months each year. A vehicle able to travel over such terrain at fairly high speeds would be very useful to the people who lived / live there. Such a vehicle was invented more than a century ago. It was / is called an aerosleigh / aerosled / snowplane, or aerosan in Russian. 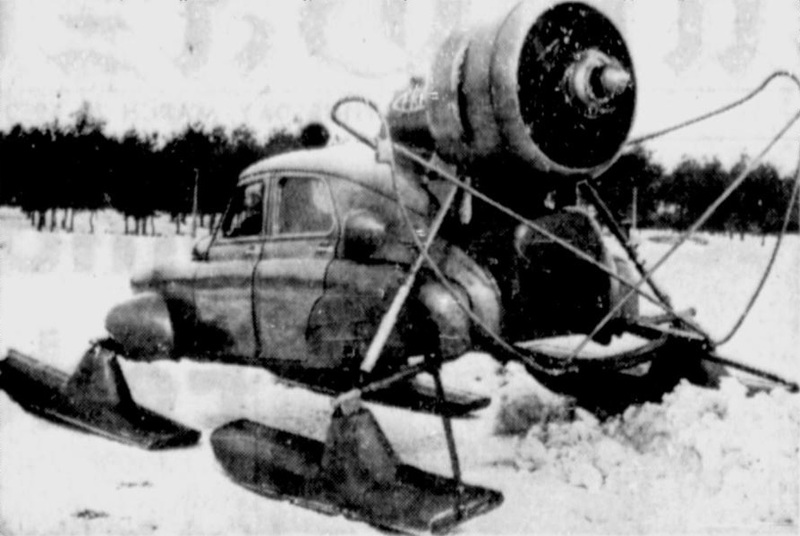 An aerosled was / is a propeller-driven snow vehicle mounted on skis. The first ones were made around 1903-05, in what was then the Russian Empire, and… Yes, my eager beaver reading friend, the tsar when this took place was Nikolai II, born Nikolai Alexandrovich “Nicky” Romanov, an unimpressive monarch mentioned in a December 2018 issue of our blog / bulletin / thingee. May I continue? Thank you. Did you know that one of the individuals who designed and tested an aerosled in the early 20th century, around 1909-10 to be more precise, was a young Russian engineer by the name of Igor Ivanovich Sikorsky. Mind you, this gentleman also designed and tested a helicopter around that time. This latter endeavour did not prove successful. As we both know, Sikorsky went on to design very successful aircraft and helicopters, both in Russia and his adopted land, the United States. And yes, my reading friend with the memory of an elephant, this gentleman was mentioned in an August 2017 issue of our blog / bulletin / thingee. Used by the Russian army during the First World War, for reconnaissance, liaison and attack, aerosleds proved equally useful to the Workers’ and Peasants’ Red Army, or Raboche Krestyanskaya Krasnaya Armiya, during the 1920s and 1930s. Aerosleds were also used in large numbers throughout the Second World War, in the Union of Soviet Socialist Republics (USSR), for transport, reconnaissance, medical evacuation, liaison and attack. Would you believe that Andrei Nikolayevich Tupolev, one of the great Russian / Soviet aeronautical engineers of the 20th century and a gentleman mentioned in a February 2018 issue of our blog / bulletin / thingee, designed a series of aerosleds during the 1920s and 1930s? I also hear that Zavod imeni Stalina, an automobile manufacturing factory mentioned in a February 2019 issue of our blog / bulletin / thingee, made aerosleds during the Second World War. Small world, isn’t it? And yes, I do like thingees. How did you guess? During the 1920s and 1930s, various departments of the Soviet government used aerosleds for a variety of purposes: to provide medical assistance, patrol the borders, look for missing people, link communities, evacuate the injured and the ill, deliver the mail, etc. By the mid 1950s, the Second World War vintage aerosleds used to perform these missions were getting long in the tooth, however. If I may be permitted to digress for a brief instant, aerosleds similar to the ones used in the USSR were developed in Canada, especially in places like Saskatchewan and Alberta, during the 1920s and later, or earlier. One only needs to think about the vehicles designed and made by Karl Lorch of Spy Hill, Saskatchewan, from 1929 or so until the mid 1950s. Over the years, Lorch and his small team made no less than 600 vehicles, for the most part in the Spy Hill Garage owned by Lorch himself. A small shop set up in the United States produced a number of vehicles as well. The vehicles made there could be fitted with wheels for operation in warmer weather. A request for information about the Lorch aerosled even came from a ministry in the USSR. In Moosomin, Saskatchewan, the staff of a small shop headed by Robert Fudge produced about 400 Snow Sedans between 1929 and 1956. The propeller of one of these vehicles found its way into the world class collection of the Canada Aviation and Space Museum. From the looks of it, the distance between the skis of many Canadian snowplanes, as aerosleds were commonly called in Canada, was identical to that of the runners of the horse drawn sleighs of the time. Used by doctors, taxi operators, power and telephone companies, etc., these vehicles played an important in the development of land transportation in Saskatchewan and Alberta. It is worth noting that one of the most important, if not the important propeller making company in the country owed its origin, at least in part, to work conducted on aerosled propellers around 1937-39, by one of its founders, Leonard Short. The activity generated by the growth of the bush flying industry in Canada and the launch of the rearmament program of the Royal Canadian Air Force, around 1935, led to the creation in Winnipeg, Manitoba, in 1938, of S & S Aircraft Limited by Short and E.G. Smith. During the Second World War, this company manufactured thousands and thousands of wooden two-bladed fixed pitch propellers used on various types of basic and advanced training aircraft manufactured or not in Canada. The young company thus contributed to the success of the British Commonwealth Air Training Plan, a major Canadian contribution to the Allied victory in the Second World War. And yes, my reading friend, several / many aircraft in the mind blowing, yes, yes, mind blowing collection of the Canada Aviation and Space Museum, in Ottawa, Ontario, were fitted with S & S propellers, but I digress. It should be noted that it was by using the name of Granby Aviation that a newspaper announced the destruction, in July 1948, of the workshops of the company, following a fire. S & S itself seemingly went out of business after the Second World War as well, but let’s go back to our story. Eager to develop the economy of the northern regions of the USSR, the government initiated a number of measures. In April 1957, for example, the Ministry of the Aviation industry ordered the experimental design bureau headed by Nikolai Ilyich Kamov to develop a new postal aerosled in cooperation with the Ministry of Communications. The latter approved the basic specifications of the new 2-seat vehicle. Able to carry up to 500 kilogrammes (1 100 pounds) of cargo, the aerosled would be based on the chassis of the GAZ M-20 Pobeda automobile. Design of the Sever-2, as the vehicle was called, began in earnest. You have multiple questions, my ever eager to learn reading friend? To paraphrase a line from In the Air Tonight, a 1981 song made famous by British singer and drummer Philip David Charles “Phil” Collins, I can feel them coming in the air today. Let us begin without any further ado. The aforementioned Kamov was the most important helicopter pioneer in the USSR. The experimental design bureau he headed specialized in the design and production of helicopters fitted with 2 coaxial main rotors that turned in opposite direction. Some information on this fascinating approach can be found in an August 2017 issue of our blog / bulletin / thingee. How about Richard Evelyn Byrd and Floyd Bennett, you ask, my reading friend? How about them, say I? The May 1926 flight of these 2 Americans has been the subject of some controversy since the mid 1990s. Indeed, an erased yet readable entry in Byrd’s diary seemed / seems to indicate that he and Bennett turned back 265 or so kilometres (165 miles) short of the North Pole. It should be noted that the crew of the Italian-made semi-rigid airship Norge reached the top of the world 3 days after the (unsuccessful? fraudulent??) attempt made by Byrd and Bennett. The expedition in question, the Amundsen-Ellsworth transpolar flight of 1926, which included the famous Norwegian explorer Roald Engelbregt Gravning Amundsen, was financed by American explorer Lincoln Ellsworth and the Norwegian air navigation association, or Norsk Luftseiladsforening. Given that American explorers Frederick Albert Cook and Robert Edwin Peary, not to mention their perfectly innocent Inuit guides, may not have reached the North Pole in April 1908 and April 1909, as a result of an honest mistake or a bald face lie, it is possible that the crew of the Norge reached the top of the world before anyone else. Shocking, isn’t it? If you can’t trust Americans, who can you trust? But back to our story, and one of your questions. A Gorkovsky Avtomobilny Zavod GAZ-M20 Pobeda automobile on display at the 1954 edition of the Leipziger Messe, Leipzig, East Germany. This very important East European trade fairs was mentioned in the January 2019 issue of our blog / bulletin / thingee. Deutsche Fotothek via Wikipedia. The M-20 Pobeda, or GAZ-M20 Pobeda, as it was called in later years, intrigues you? Attaboy! Let us share this opportunity to shamelessly pontificate, in true curatorial fashion. Our story began around 1943, at the Gorkovsky Avtomobilny Zavod (GAZ). It followed in the footsteps, dare I say road tracks, of work done since the late 1930s, to develop an easily maintained and robust streamlined automobile comparable to the best designs produced in the United States. The new vehicle was to be called Rodina, or homeland in Russian, but Josif Vissarionovich Stalin, born Ioseb Jughashvili, decreed that that it be called Pobeda, or victory in Russian. And yes, this monstrous leader of the USSR for almost a quarter century was mentioned in February 2018, January 2019 and February 2019 issues of our blog / bulletin / thingee. By the way, did you know that the gigantic GAZ factory was constructed with the help of Ford Motor Company, an American automobile giant mentioned in December 2018 and February 2019 issues of our blog / bulletin / thingee? To some extent, said factory was a duplicate of Ford Motor’s gigantic facilities. And yes, my reading friend, you are quite correct. GAZ made aerosleds during the Second World War. Ours is a very small world indeed. The prototype of the Pobeda was completed in November 1944, just in time for the 27th anniversary of the Great October Socialist Revolution, which actually took place in November 1917, as we both know. It was one of the first, if not the first Soviet automobiles to include very little in the way of foreign influence. The decision to proceed with production of the Pobeda was seemingly made around August 1945. The first production vehicle was to roll out of the factory in June of the following year. This very short deadline was a source of concern to the engineers but any attempt to request a delay would have been quite unwise. A person could find herself / himself accused of being an enemy of the people. The end result could be a one way trip to Siberia. The first production Pobeda rolled out of the factory in June 1946, as planned. Given the gruelling conditions in the USSR in the months that followed the end of the Second World War, only 25 or so vehicles, all of them virtually hand made, left the factory during the second half of the year. If truth be told, precious few Pobedas were built between June 1946 and October 1948. Worse still, these vehicles proved all but useless. Deficiencies affected almost every aspect of the design. The absence of metal sheets large enough to produce the body of the car, for example, meant that relatively narrow strips of poor quality steel had to be used. These had to be welded together. As a result, early Pobedas leaked like colanders. The overall situation was so bad that the government ordered that production of the Pobeda be stopped. GAZ’s director was sacked. One hopes that nothing worse happened to him. Engineers at the factory launched an in depth program of laboratory and road testing to improve the quality of the vehicle. All in all, GAZ introduced about 350 improvements. The improved Pobeda that went into production in November 1949 proved both rugged and durable. It also had good fuel consumption and performance, especially on the poor roads often found in the USSR. It has been suggested that GAZ engineers tested the strength of their automobile by placing a number of Pobedas near the site of the first Soviet nuclear test, held in August 1949. Yours truly finds this a tad hard to believe, but who knows? As time went by, GAZ introduced various improvements. The Pobeda thus became the first Soviet automobile fitted with an AM radio set, hydraulic brakes on all wheels, an electric heater, turn signals and electric wipers. A taxi version designed in 1949 became the first widely used vehicle of this type in the USSR. A convertible Pobeda was introduced that same year. A somewhat impractical vehicle given the climate of the USSR, this automobile may have been produced as a result of sheet metal shortages. It is worth noting that the country’s dreaded secret police / spy agency, in other words, the Ministerstvo Gosudarstvennoy Bezopasnosti / Ministerstvo Vnutrennikh Del / Komitet Gosudarstvennoy Bezopasnosti, required and obtained examples of a souped-up version of the Pobeda it used for many years. A 4-wheel drive version of the Pobeda known as the M72 was introduced in 1955, possibly at the request of Nikita Sergeyevich Khrushchev. You may remember that the first secretary of the central committee of the Communist party of the USSR was mentioned in a February 2019 issue of our blog / bulletin / thingee. By the time production of the Pobeda came to a halt, in 1958, about 240 000 of these nearly indestructible automobiles had been built. A great many of them were used by various government organisations and departments. This being said (typed? ), a small number of well off and patient private citizens managed to acquire a Pobeda of their very own. These automobiles were presumably treated with the greatest of care. The Pobeda was quite possibly the first Soviet automobile to be exported in any number. Fabryka Samochodów Osobowych (FSO), a newly founded (1948) government owned company in Poland, produced 255 000 Warszawas, as the Pobeda was called in that country, between 1951 and 1973. These vehicles were the first automobiles made in Poland after the Second World War. Would you believe that the Soviet automobile was not the one the Polish government had in mind when construction of FSO’s factory began? No siree. That automobile was a popular design produced by Fabbrica Italiana Automobili Torino (FIAT), a well known company mentioned in another March 2019 issue of this blog / bulletin / thingee. The deal fell through for one or more reasons. Stalin, for example, stated that socialist / communist countries under the control of the USSR should not seek the help of capitalist countries. In turn, the United States provided Italy with large amounts of very cheap coal, one of the items that Poland was to use to cover the cost of the production rights of the FIAT automobile. One has to wonder if the American government acted as it did because it wanted to prevent capitalist countries under its control from doing business with countries under the control of its arch enemy, the USSR. And yes, my reading friend, you are quite correct in thinking that the first Warszawa assembled in Poland, with Soviet parts, was unveiled in November 1951, just in time for the 34th anniversary of the Great October Socialist Revolution. The first Warszawa entirely made in Poland left the factory in 1956. By then, FSO was already exporting a number of vehicles to socialist / communist countries like Romania, China, Bulgaria and Albania. Given the long production run of the Warszawa, you will not be surprised to hear (read?) that the final versions greatly differed for the first ones. Although reliable and tough, these final versions did not have very good fuel consumption and performance. So, all in all, about 495 000 Pobeda type vehicles were produced between 1944 and 1973. Would you believe that FSO produced both van / light truck and minivan / minibus derivatives of the Warszawa, almost 970 000 in fact, between 1958 and 1998? Why, you should. Would I lie to you? The techniques used to develop and produce the Pobeda formed the basis of the Soviet automobile industry after 1945. This automobile became a symbol of the gradually improving conditions in the USSR after the gruelling years of the Second World War. One might argue it played a similar role in Poland. Pobedas in working order were / are collector’s items in 21st century Russia. Indeed, this type of vehicle had / has a cult following among Russian automobile collectors. And yes, my reading friend, that digression was a particularly long one, even by yours truly’s own standards. This being said (typed? ), it should help us proceed down the road to enlightenment. As you may have guessed, the Kamov experimental design bureau used the chassis of the Pobeda automobile, either willingly or unwillingly, in order to reduce the design, production, maintenance and repair costs of the Sever-2 aerosled. Given the high level of friction between the skis and the snow and ice the aerosled would travel over, however, the engineers had to use an aircraft engine 5 times as powerful as the engine of the Pobeda, which meant that a lot more fuel had to be carried. Would you believe that the Sever-2 did not have a speed indicator? I mean, how could one measure the velocity of a vehicle mounted on skis? A question if I may, my reading friend. How did the driver / pilot of a Sever-2 slow down her / his ride? No, she / he did not push an anchor out of a window – an amusing and original answer, I will admit. Our engineer friends used a reversible pitch propeller, and… You don’t quite understand what I mean by this, do you? Does such a propeller work a bit like the ceiling fans whose blades can move air upward or downward, you ask? Why, yes, it did / does. You’re a smart cookie. As a reward for this brightness, I shall pontificate for a moment on the origins of this type of propeller, thus providing you with your weekly ration of aviation and space content. A propeller is said to be reversible if the angle of its blades can pass from a low setting through a zero angle to a negative or reverse setting. This means that even though said propeller keeps on turning in the same direction, it reverses the flow of air, which is projected forward and no longer backward. As such, the reversible pitch propeller can be said to be a special type of variable pitch propeller. You will remember that a variable or controllable pitch propeller is one whose blades can be set at different angles in mid flight to give the best possible performance at any given speed. The reversed thrust of a reversible pitch propeller proved very useful in slowing down, turning or backing up the large civil and military flying boats that entered service from the mid 1930s onward. The most frequent application of the reversible pitch propeller, however, was in slowing down heavy landplanes after landing. When used in combination with conventional brakes, the new propeller often cut the landing run in half. As well, it significantly improved safety on ice-covered runways. The slight increase in weight was more than compensated by the increased safety and versatility. As was / is / will be often the case, the reversible pitch propeller did not burst out of the forehead of Father Time, like the goddess Athena, fully armed and ready for action, during the 1930s. A few airships were fitted with reversible or reverse pitch propeller around 1910, for example. Such propellers made it possible for them to slow down rapidly and even move backward, with some caution. One of the first reversible pitch propeller fitted to an aircraft was flight tested by the United States Army Air Service as early as 1918. Frank Walker Caldwell, a gentleman mentioned in a November 2018 issue of our blog / bulletin / thingee, was in charge of the project. This somewhat unreliable propeller was not put in production. An American aeronautical giant, Curtiss-Wright Corporation, may have been the first company to put a reversible pitch propeller in production, around 1935-36. And here lies a tale. All right, all right, a brief tale. Jeez, what a grouch. One of the individuals who played a great role in the development of the variable pitch propeller was a Canadian engineer whose world-renowned investigation of propeller theory began in 1908. Wallace Rupert Turnbull started to study variable pitch propellers during the First World War, while he worked in the United Kingdom. His 1917 mechanically-operated prototypes having proved impractical, he requested a grant from the Honorary Advisory Council for Scientific and Industrial Research, today’s National Research Council of Canada, after the end of the conflict. Working in cooperation with Canadian Vickers Limited of Montréal, Québec, Turnbull completed an electrically-operated propeller in 1927. Flight tested in June of that year, on an Avro 504 training airplane of the Royal Canadian Air Force, this prototype proved quite efficient and reliable. This famous propeller is part of the stupendous, yes stupendous collection of the Canada Aviation and Space Museum, in Ottawa, Ontario. And yes, Canadian Vickers was mentioned on a few occasions, since September 2018, in issues of our blog / bulletin / thingee. Faced with the lack of Canadian backers, Turnbull sold his patents to a small American company, Reed Propeller Company, which became a subsidiary of Curtiss-Wright in 1929. Production of a greatly improved version of the Turnbull propeller began barely 4 years later. The importance of the new propeller was such that, during the summer of 1938, Curtiss-Wright took responsibility for the programme away from its Curtiss Aeroplane Division and created a Curtiss Propeller Division with its own distinct factory. To simplify operations, the manufacturer of the hollow steel blades used on the propeller, Pittsburgh Screw & Bolt Corporation, was taken over in October 1939. During the course of the Second World War, the Curtiss Propeller Division of Curtiss-Wright produced about 150 000 propellers. A typical user was the Curtiss P-40 Warhawk / Kittyhawk, one of the many fighter aircraft in the Canada Aviation and Space Museum’s collection. Although the electric propeller proved reliable, some issues, among them a somewhat slow rate of pitch changing, meant that engine manufacturers often went to other designs towards the end of the conflict, but back to our story and our aerosled. The Ministry of Communications gave its blessing to the fabrication of a prototype of the Sever-2 in late January 1958. Testing began in mid March. The engineering team expected to find deficiencies. It was not disappointed, which was perfectly normal. One of the many improvements made to the design of the Sever-2 may, I repeat may, have been the use of a material similar to Teflon to cover the lower surfaces of the skis. The new material had near magical properties. It never stuck to snow or ice, and significantly improved the speed of the vehicle. The new skis replaced the ones used initially, which were fitted with a heating system to prevent the skis from adhering to snow or ice. The testing of the modified Sever-2 prototype began in early January 1959. A broken propeller brought testing to stop until March. Representatives of the Ministry of Communications who saw the Sever-2 perform at that time recommended that it be put in production. They seemingly did not know that an order for 100 vehicles had been signed in December 1958. Given the publication date of the photo at the beginning of this article, one can assume that it showed the modified prototype of the Sever-2, which was quite unusual, given the secretiveness of the Soviet government. The first 10 or so production Severs, as the new aerosled gradually became known, began to carry mail in the Soviet Far East in November 1959. The crews quickly reported some problems. The design of the aerosled was modified yet again. The 100th and last Sever was delivered in 1961. The Ministry of Communications operated all but 3 of these vehicles, throughout Siberia. Two were used in or near a harbour in the Soviet Far East, while one may have been damaged beyond repair before it was delivered. While some areas of the USSR were fully prepared to use the Severs, having prepared courses for the crews and set up garages for maintenance, repair and storage, others were not as efficient. Indeed, the authorities in some regions stored the Severs in the open air 12 months a year. At least a few had not even bothered to acquire adequate quantities of fuel. The crews of the Sever gradually discovered that, even with all the improvements added since the first trials, the new aerosled was not fully satisfactory. The limitations of its heating system, combined with the limited amount of insulation, forced crews to travel with their heavy clothing, which proved cumbersome given the small size of the cabin. As well, the suspension system of the Sever, which was very similar, if not identical to that of the Pobeda, was simply not strong enough given the heavy loads of mail and the roughness of the terrain. It has been suggested that the stresses endured by the structure and suspension system of the aerosled were 5 times those endured by a typical Pobeda. In any event, not enough Severs were ordered given the size of the territory they were ministering to. In spite of it all, each Sever covered an average of 12 000 to 15 000 kilometres (7 500 to 9 300 miles) per winter. By the spring of 1963, the mileage of the fleet exceeded 1 500 000 kilometres (930 000 miles). The Kamov experimental design bureau tested the Sever’s successor in 1962. This new vehicle, the 11-seat Ka-30, was not based on an automobile. It went into production in 1966 and proved both very successful and more versatile. The new aerosled could be fitted with wheels or floats to operate in summer time, on land or water, for example. Quickly taken of service, the Severs were wither scrapped or abandoned. One of these aerosleds was cleaned up, if not restored, not too long ago. It is on display at the Central museum of the military air forces, or Tsentral’nogo Museya Voenno-Vozdushnykh Sil, near Moscow. Was this article to your liking, my reading friend? Yes? I’m glad to be of service. See ya later.